At the ATD TDI conference, we will provide you with groundbreaking methods to stay ahead of innovations in healthcare. 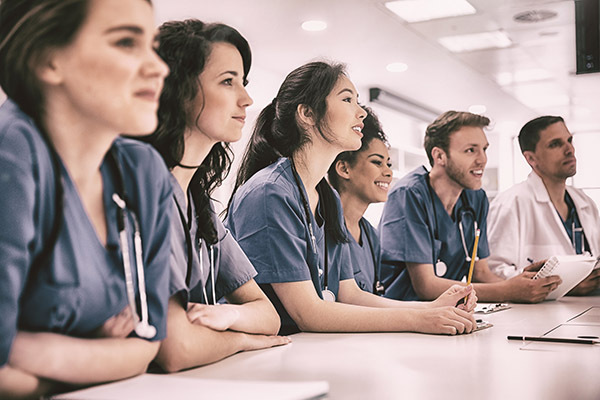 Healthcare compliance officers, talent management professionals, instructional designers, administrators, trainers, and facilitators—especially those dealing directly with medical compliance. Patient experience scores ✔ Become an expert in branding your organization. and healthcare talent ✔ Develop onboarding specifically for healthcare to start employees strong and keep them for the long haul. improved engagement ✔ Learn latest trends and comprehensive talent innovation programs. ✔ Implement the latest leadership behavior methodologies, coaching techniques, and modern management practices. ✔ Create savvy training and development to improve financial performance. Ever-changing regulations ✔ Institute best practices for healthcare compliance training. personnel ✔ Discover how disruption in healthcare online, mobile, and microlearning experiences can keep your workforce cutting-edge. between all medical staff ✔ Improve collaboration and drive innovation through effective learning.